Team Lightning - Goat Yoga! If you're wondering what the perfect start to 2019 looks like, look no further. Get your mind and body ready for the coming year with a heathy dose of yoga and laughter with this one-of-a-kind goat yoga experience! Each class is taught by an experienced instructor along with the help of some adorable four-legged pals. These pygmy and dwarf goats are highly sociable, and love cuddling up with friendly humans as they stretch and pose! And the best part? You can join in the fun with Team Lighting for just $10, that's a 60% discount! Use the password "Lightning" to view the class and code "LightningCraft10" to unlock your discount. There's a limit of 20 discounted tickets so hurry up and register! Kids: This event is open to all ages! Pets: Pets are not permitted. Please reach out to Shenanigoats with questions about service animals. Weather: This event is rain or shine (indoors). Registration: Mandatory! Please register here using password "Lightning". The first 20 participants can use the code "LightningCraft10" to unlock discounted tickets. 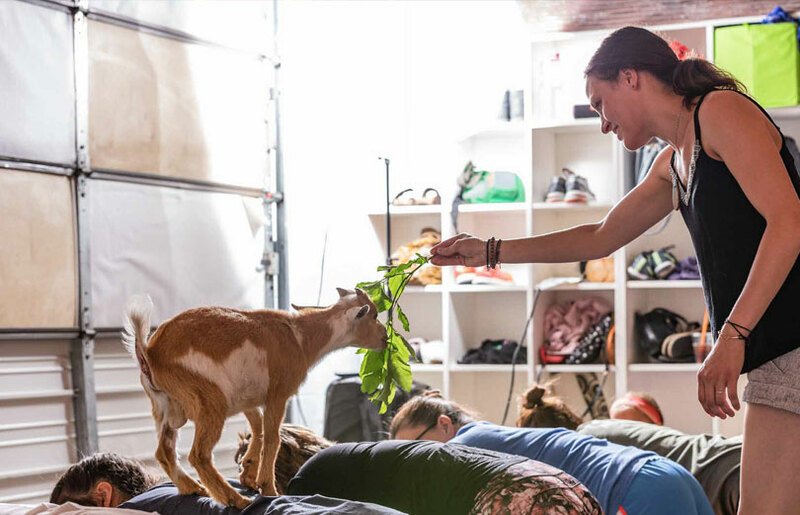 Goat Yoga is sweeping the globe and there’s a good reason why. The joy and laugher people experience when crawling on all fours with goats frolicing around or on them is non-stop. Goats are highly social animals, they do best in herds but the interaction they have with humans is different than other barnyard critters. This social behavior along with some amazing agility is what draws people to caprines. If you’ve never seen goats jump along a cliff side or reach ungettable heights you’ve not been looking closely at our four legged friends. When we first posted pictures of our Spring babies a friend of ours shared a link to goat yoga out in Oregon and asked if we could do this on our farm. We chuckled and said sure as soon as the cold, wet weather passed we would find a way to make that happen. Still we needed to find a way to pay the bills and Max was a firm believer in goat-landscaping as a business, Jamie thought Max was crazy. In April when Jamie was reading a post in the popular “Next Door” app, she found a request for someone asking about goats for brush clearing and Jamie’s jaw dropped as she arranged for our first landscaping gig late in April. From there social media has driven our little company forward so fast our four legged feet were scurrying to keep up. With each social media post we made about goat landscaping we had requests for goat yoga. With both Max and Jamie having training and background in Social Work and community organizing we were quick to meet the request and we held our first class on June 10th and it’s been goat, goat, goating ever since. In the summer heat we sidelined our landscaping crews and put our focus fully on yoga. Our herd has grown even bigger as we were hit with the demand for more baby goats. Mac, Otis, Frankie Sinatra, Sheep, Penelope, Harvey Milk, Miles Davis, Noah, Raul, Maximus, Levi, Mush, Rootbeer Float, Liberty, Poindexter, Wigglesworth, and a few more are in our rotation for yoga classes. Many of these babies were purchased from small farms throughout Tennessee and as far as Kentucky and Alabama.